Mcclellan, Catharine. "Tlingit". The Canadian Encyclopedia, 16 October 2018, Historica Canada. 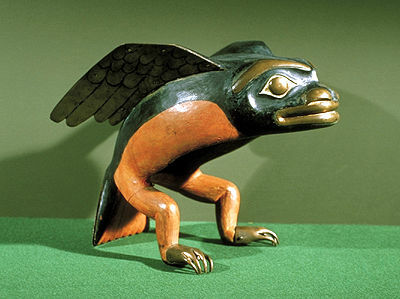 https://www.thecanadianencyclopedia.ca/en/article/inland-tlingit. Accessed 26 April 2019. The Tlingit (sometimes also known as the Łingít), meaning “people of the tides,” are Indigenous peoples of the Pacific Northwest Coast of North America, who define themselves as sharing a common cultural heritage. In the 2016 census, 2,110 people identified as having Tlingit ancestry. This most northerly Northwest Coast First Nation traded in copper, blankets, shells, furs and slaves. 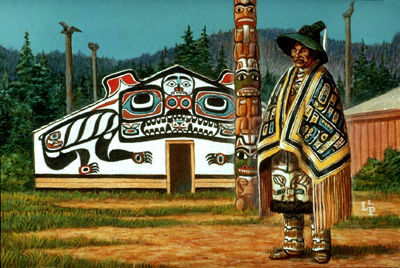 Tlingit houses, poles and robes demonstrate highly developed art forms. Tlingit maple wood dance hat, circa mid-19th century, from Admiralty Island, Alaska. 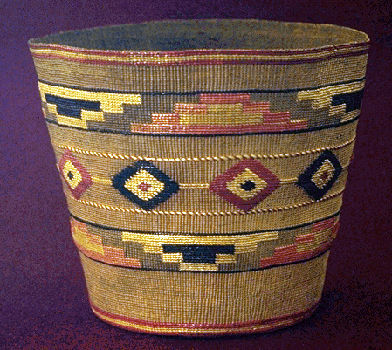 This Tlingit basket was made from spruce roots. Tlingit territories are located in the Pacific Northwest and cover parts of present-day British Columbia, Yukon and Alaska. While some Tlingit traditionally occupied areas along the coast, others made their homes further inland. (See also Indigenous Territory.) In the 2016 census, 2,110 people identified as having Tlingit ancestry. The resources of the coastal regions and the boreal forest around the large lakes forming the headwaters of the Yukon River	have always been important to the Tlingit livelihood. In the 19th century, most of their ancestors, some of whom had come from the coast, lived on the upper reaches of the Taku River that flows into the Pacific Ocean near Juneau, Alaska. 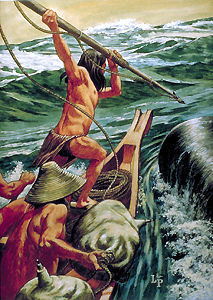 Inland Tlingit depended heavily on annual salmon runs in the Taku Basin, but also hunted caribou, moose, sheep and goats, as well as small game, especially marmots	and birds. The Tlingit are a matrilineal nation divided into moieties or groups; each moiety consists of many clans. The clans of the Teslin Tlingit, for example, include Kùkhhittàn (Raven), Ishkìtàn (Frog), Yanyèdi (Wolf), Dèshitàn (Split Tail Beaver) and Dakhl’awèdi (Eagle). Tlingit in other regions could have different clans. These groups structured rank, marriage and naming practices. 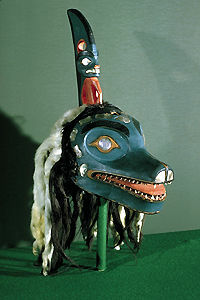 Social relations rested on reciprocal obligations between members of clans in opposite moieties, the most important being associated with death and memorial feasts or potlatches	that followed a year or so afterwards and were the occasion of rich oratory, singing and dancing as well as symbolic visual display. Tlingit living inland or on the coast often married one another, and also intermarried with surrounding groups, such as the Dene (Athapaskans) and Tahltan. With authority limited to each clan, there were no band chiefs until after the Second World War, when the Department of Aboriginal Affairs and Northern Development instituted elected band chiefs and councils. (See also Federal Departments of Indigenous and Northern Affairs.) Today, the Tlingit in Teslin have their own judicial system. Although increasingly acculturated to European society following an early 20th-century gold rush and the development of mining activity near Atlin, British Columbia, and especially after the building of the Alaska Highway in 1942, the Tlingit have reclaimed traditional arts and have set up commercial enterprises, such as canoe	and snowshoe manufacturing. The Tlingit also have a rich oral literature. Poets and writers Nora Marks Dauenhauer and Richard Dauenhauer have edited classic collections of Tlingit literature, including: Haa Shuká, Our Ancestors: Tlingit Oral Narratives (1987); Haa Tuwunáagu Yís, for Healing Our Spirit: Tlingit Oratory	(1990); Haa Kusteeyí, Our Culture: Tlingit Life Stories (1994); and Anóoshi Lingít Aaní Ká/Russians in Tlingit America: The Battles of Sitka, 1802 and 1804 (2015, edited in association with Lydia T. Black). Tlingit (or Łingít) is the name of the language spoken by the Nation. Tlingit is primarily spoken in Teslin and Carcross, Yukon. Tlingit is part of the Na-Dene (or Dene) language, which is part of the Athapaskan linguistic family. Tlingit is spoken mostly in Atlin	in northernmost British Columbia and Teslin in adjacent Yukon. According to the 2016 census, 255 people identified as Tlingit speakers, with 76.5 per cent living in Yukon and 21.6 per cent in British Columbia. During the late 1800s, the Tlingit moved to the Yukon as a means of accessing its rich fur resources, but also because of the Klondike Gold Rush of 1897–99. Their semi-nomadic subsistence pattern was equally adapted to the Yukon, where furbearers were more numerous, but salmon	resources were less dependable. Their technology, like that of neighbouring Athapaskans, such as theTutchone, was well suited to the hard conditions of the subarctic Cordillera. The Tlingit sometimes feuded with the Tahltan over rights to fish salmon and to control the flow of fine furs from the interior to the coast. Both groups coveted fur of the Liard River	Kaska, but were themselves dominated by Tlingit living on the coast who monopolized access to European fur traders. The Inland Tlingit signed no treaties. In 1993, the Council of Yukon Indians (now the Council of Yukon First Nations) successfully negotiated a land claims	settlement. They have also joined the Council of Yukon First Nations (which succeeded the Council of Yukon Indians in 1995) in an effort to bring about a First Nation government to operate in the Yukon along with the territorial and federal governments. In 1995, after more than two decades of negotiations, the federal and Yukon governments’ Teslin Tlingit Council Final and Self-Government agreements came into effect. The agreements govern more than 10,000 km2 of Teslin Tlingit territory and incorporate aspects of the traditional clan culture. Nora Marks Dauenhauer and Richard Dauenhauer, eds., Haa Shuká, Our Ancestors: Tlingit Oral Narratives (1987); Haa Tuwunáagu Yís, for Healing Our Spirit: Tlingit Oratory (1990); Haa Kusteeyí, Our Culture: Tlingit Life Stories (1994). Elizabeth Nyman and Jeff Lear, The Legacy of a Taku River Tlingit Clan (1993). J. Helm, ed, Handbook of North American Indians, vol 6: Subarctic (1981); Elizabeth Nyman and Jeff Lear, The Legacy of a Taku River Tlingit Clan (1993). Nora Marks Dauenhauer, Richard Dauenhauer and Lydia T. Black, eds., Anóoshi Lingít Aaní Ká/Russians in Tlingit America: The Battles of Sitka, 1802 and 1804 (2015). COUNCIL OF YUKON FIRST NATIONS Learn more about this organization and the First Nations it represents. YUKON MUSEUMS Learn more about the Teslin Tlingit Heritage Centre. TAKU RIVER TLINGIT Explore the website of the Taku River Tlingit First Nation. GOVERNMENT OF CANADA Read about the Teslin Tlingit Council Final Agreement.